any sign of precipitation, and produce a beautiful fall sunset. Speaking of work, I have been pulling some insane hours the last couple of weeks. On average, my days last 12-14 hours. And during those days, I am involved in intense manual labour. We harvested the entire 140 acre vineyard in under two weeks, making for very close quarters in the cellar. Absolutely all the tanks and large pots of juice are fermenting at once. All of it requires constant care. We have three sessions a day of punch downs and Pulse Airs. Punch downs are a gentle way of pushing the cap (made of grape skins and seeds) down under the juice, keeping the cap moist and homogenizing anything added to the wine, i.e. tannins, yeast. Pulse Airs are used on the tanks to achieve the same results as punch downs. We use a wand that is injected into the racking valves of the tanks to push air up through the juice and over the cap. 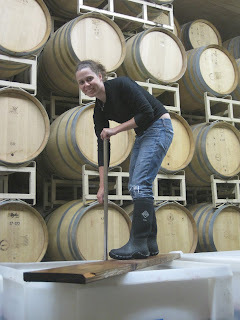 We've also started filling barrels of pressed pinot noir, which means we also have to clean barrels. 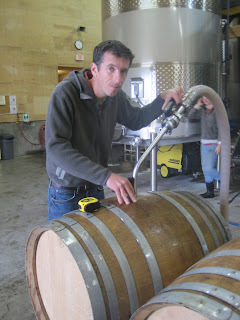 Cleaning and filling barrels is an all day process that we've been working on all of this week. 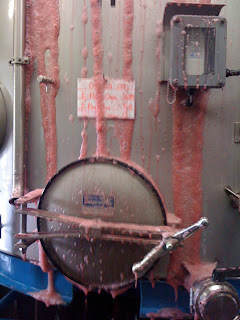 Each day we press more tanks and pots of wine that is ready for aging. In the next few weeks, everything will be out of the cellar and in barrels, awaiting the perfect time to be released. But for now, it is a true work out ensuring that all the wine work is completed each day. I now have a voracious appetite, eating breakfast, two lunches, and sometimes two dinners daily. I haven't eaten like this since I was in high school athletics. Great to be able to eat anything and everything without gaining an ounce again! The hard part will be when I have to return to my normal diet once I am back home. And home is now only a month away. I am officially half way through my internship. The long hours have pushed me to the brink, and I can see how why this is only a seasonal job. I can already feel myself burning out, and will be ready for some down time when I return to Dallas. Sea lions are too cute! Over the past couple of weeks I have seized the few days I had off from the winery to explore Oregon. My first trip was to the Oregon coast. Having spent years living on the Florida beaches, this was quite a departure from the land of sun worshippers and dolphins. As I decended down the cliff, the wind whipped about, requiring that I keep my jacket on. As I made my way across the beach, I gave close inspection to the sea anemones in the tidepools. I looked for whales, without luck. After spending time enjoying the ocean, I headed to the town of Newport. The sea lions were in full symphony on the pier. I easily passed thirty minutes watching one sea lion try to find a spot to sunbathe. He was clearly on the bottom of the totem pole, as no one would allow him to ascend onto the deck. Another sea lion sneezed on his neighbor and that was enough to motivate me to move on. A stroll through the seaside downtown ended with a short drive to the Rogue Brewer's on the Bay, their world headquarters. A path through the fermenting tanks leads you to a pub that overlooks the bay. A tasting flight of four and a huge angus beef burger comprised lunch- discovering a few new favourite beers. The sunny weather was gorgeous, but I hear watching a storm roll in off the water is pretty incredible too. Another day off was spent at Bagby Hot Springs, close to Bend. The drive was absolutely breathtaking. Being that it was the end of September, the trees were starting to show their colours. Several winding backroads and a few u-turns, I found the hot springs tucked away in Mt. Hood National Forest. I managed to set up the tent at the riverside campsite and made the mile and a half hike to the hot springs itself. It was a rustic and beautiful setting. The private rooms each have a hand carved log in which a faucet pours in 138 degree water. You can regulate the temperature with buckets of cold water. It took me a while, but finally got the temperature just right. Sliding into the tub with a glass of wine was just what the doctor ordered. I was so sore from the hard labour I had put in at the winery. I eventually was able to convince myself to go back to my tent after two hours of soaking. The next morning I slept in until 145pm! (I know, gross.) A combination of the rain on the trees and the babbling of the river gave strong argument to stay in bed a while longer. 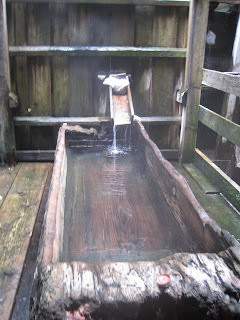 That afternoon I made a second trek to the hot springs, this time checking out the tubs outside. It was so nice to look at the trees and listen to nature while having another soak. I did not want to leave, but had to make it back to Eugene for work the next morning. If you're ever in Oregon, I highly recommend making the trip out to Bagby. This past weekend I got to spend time with my friends Sarah and Allen. They live nearby in Dallas, so I was happy to see familiar faces from home. Sarah used to live in Portland, and was in town to finalize her architect registration paperwork. We had something to celebrate! We spent Friday evening with some of her old friends- Andrea was a fabulous host! Upon arriving at the hotel, we requested a cot. Turns out the hotel doesn't provide those, so we all crammed into one bed. Needless to say, I was toasty all evening. Saturday was dedicated to seeing Portland. Breakfast was devoured at the Doug Fir, a very cool Skylab Architecture project. 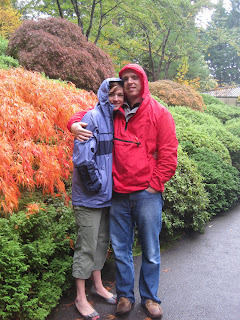 We explored the Japanese Gardens in the rain- very relaxing. 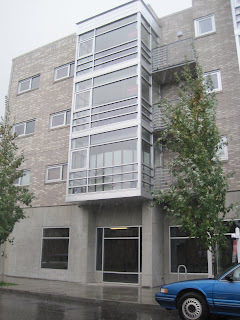 Touring around Portland more, Sarah showed us one of the buildings she designed. So neat to see your friend's work as part of a cityscape! We did some quick shoe shopping and I left them back at the hotel. Seeing my friends in a city they know and love was a great way to spend my weekend. Hoping to explore more of this beautiful state when I get more vacation days. In the mean time, you'll find me at Benton-Lane!